Description: New genuine Acer laptop upper case palmrest. This is the plastic casing that surrounds the keyboard. 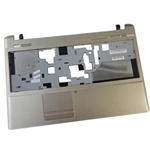 This notebook repair part includes the touchpad.